Cysteine (Cys) is a bithiol that plays a vital role in many physiological processes. However, it is difficult to discriminate Cys from homocysteine (Hcy) and glutathione (GSH), due to their similar chemical structures and reactivity. Herein, we have developed a polymeric nanoprobe, nanoHFA, for ratiometric, highly selective, and sensitive detection of Cys based on 7-hydroxycoumarin-3-carboxylic acid (HC) and fluorescein isothiocyanate (FITC)-acrylate (FITC-A) group-functionalized lipopolymer DSPE-PEG. The probe nanoHFA showed a strong fluorescence emission peak centered at 450 nm attributed to HC and a weak fluorescence emission peak centered at 520 nm due to the photoinduced electron transfer (PET) process of FITC induced by acrylate group. In the presence of Cys, the fluorescence signal at 520 nm could be lit up and the ratio of F520nm/F450nm showed a good linear relationship in the range of 5–60 μM with a low detection limit of 0.37 μM. The probe also displayed excellent water solubility and high selectivity to Cys over other biothiols such as Hcy and GSH. Moreover, we further used probe nanoHFA to detect Cu2+ ions in the range of 100–550 nM with a detection limit of 77 nM. 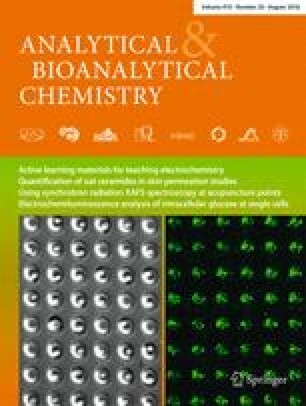 The nanoprobe was successfully applied for the quantitative detection of Cys in fetal bovine serum, and fluorescent strips were developed for facile and visual detection of Cys and Cu2+ ions. Fengyang Wang and Yingying Zhu contributed equally to this work. The online version of this article ( https://doi.org/10.1007/s00216-018-1128-1) contains supplementary material, which is available to authorized users. This work was financially supported by the National Natural Science Foundation of China (21775046, 21675055, 21635003).